Showing 1 - 1 of 1 Products for Engine Wiring Harness. 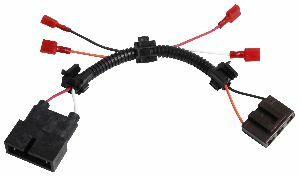 MSD Ignition control are easy to install, but we also offer several plug-in harnesses. These are especially handy for quick installation on late model vehicles! The harnesses plug directly into your factory coil and harness then four color coded wires plug into the corresponding wires of the MSD. Two wires go from the MSD to the battery and you're done with no cutting or splicing!